With the intention of minimising their environmental impact, GORE-TEX have taken the initiative of constructing materials which are more durable and therefore longer-lasting. The result is an improved 3-layer laminate which combines a smooth but hardy nylon outer fabric with GORE-TEX’s well-established, PU-coated membrane and their new C-Knit Backer Technology. Clothing crafted with C-Knit Tech will be comfier, lighter-weight and more breathable but still waterproof and robust. GORE-TEX state that comprehensive lab, washing and abrasion testing ensure that their new product is of the highest quality, while 12 months of field-testing by mountain and tour guides, freeriders and snowboarders in a variety of wet and rugged environments guarantees high performance, whatever your sport. Leading outdoor brands are equipping their new season ranges with GORE C-Knit Technology. 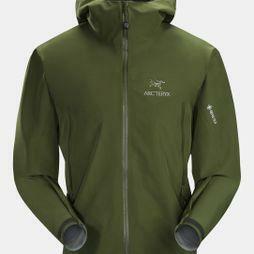 The new Arc’teryx Traverse collection is one example: the men’s and women’s Zeta LT and Zeta AR jackets (pictured) combine this new and improved tech with an adjustable storm hood, plenty of pockets and a stylish, close fit. Scrambling Stanage Edge, trail running in Snowdonia, backpacking from London to Benicàssim...the list of potential wet weather adventures goes on and on. Whether you're exploring the UK or heading further afield, preparing for unpredictable weather will ensure you get the most from your trip. We've chosen our favourite waterproof jackets and destination recommendations for whatever your next adventure may be.